Drinking coffee has numerous health benefits, including but not limited to improved energy and workout performance. Now, a research team from Southampton University in the UK suggests it may even reduce the risk of developing alcohol-related liver damage. What's more, their findings, published in the journal Alimentary Pharmacology and Therapeutics, reveal the exact amount of coffee needed to reap these alleged protective benefits. "Cirrhosis is potentially fatal and there is no cure as such," said the study's lead study author Dr. Oliver Kennedy, a researcher from Southampton University in the UK, in a press release. 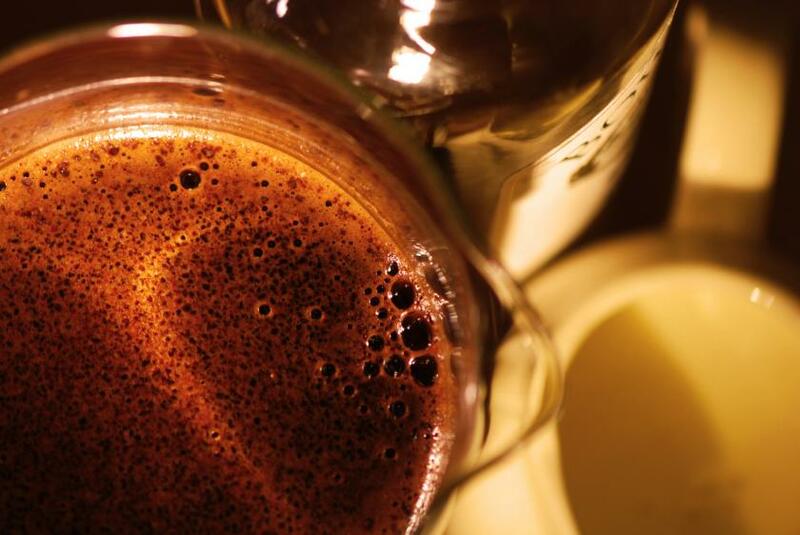 "It is significant that the risk of developing cirrhosis may be reduced by consumption of coffee, a cheap, ubiquitous and well-tolerated beverage. Coffee is a complex mixture containing hundreds of chemical compounds, and it is unknown which of these is responsible for protecting the liver." Kennedy and his research team analyzed data from nine different studies on coffee's effects on alcohol consumption, which included more than 430,000 participants. Of those participants, 1,990 were diagnosed with cirrhosis. In eight out of the nine studies researchers found increasing coffee consumption each day helped reduce risk of developing cirrhosis. One cup a day cut the risk of developing cirrhosis by 22 percent; two cups led to a 43 percent drop; three cups led to a 57 percent drop; and the maximum benefits came from drinking four cups a day, with a 65 percent reduction. While participants drinking filtered coffee seemed to reap greater benefits than those who drank boiled coffee, it's not clear if there’s a difference between what type of coffee bean can provide more or fewer benefits. However, coffee's naturally occurring chemicals are considered key to liver protection. Every year, approximately 36,427 people in the United States die from cirrhosis, and according to the World Health Organization, up to 50 percent of cirrhosis cases are caused by chronic alcohol consumption. The liver is a necessary organ for survival because it cleans the blood, processes proteins and, if you’ve ever accidentally eaten something harmful, your liver is responsible for breaking down and clearing toxins out of your system. It can regenerate most of its cells when there’s incremental damage, though years of excessive alcohol consumption can overwhelm the liver. It's important to note if you already have cirrhosis, coffee isn’t powerful enough to reverse damage. So far, researchers have only found daily coffee consumption can drastically reduce the risk of developing cirrhosis in the future. Researchers also warn not to take their findings as an excuse to drink sugar-laden lattes and other café mixtures. Source: Kennedy O. Alimentary Pharmacology and Therapeutics. 2016.